Along the short end of the towel cut strips 2 to 3 inches wide. (Once you cut about an inch into the towel, you should be able to rip each strip to then end of the length of the towel). Cut the strips to be 24 to 48 inches long depending on how long you wish the tug toy to be. Take 3 strips (different colors look nice!) and knot them together at one end. Braid the 3 strips together leaving enough room at the end to tie another knot. Trim any strings off of the ends. 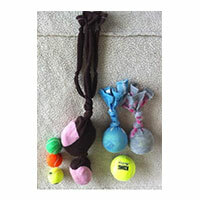 For added interest tie in some knots or a rawhide or string a tennis ball with a hole in it into your towel rope. Make them long or make them short. 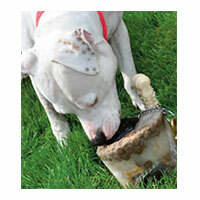 Long ropes can be tied to kennel doors for tugging fun! Take a really long sweat sock and stuff it with an old tennis ball. 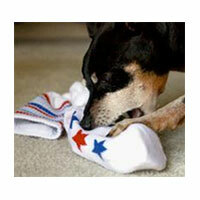 Make sure the sock is clean and on the newer side. 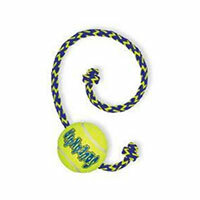 Knot the sock to hold the tennis ball in place. Use a scissor to cut strips in the open end of the sock and add some knots for interest. Drill or cut two holes in opposite sides of a tennis ball. 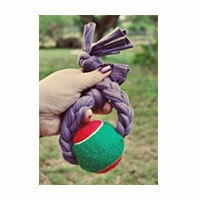 Thread a piece of extra rope or cord through the holes and tie the rope tightly just above the ball. Cut an old t-shirt or fleece (or other cloth) into strips about 2 inches wide and 3 feet long. Cut holes in opposite ends of tennis balls (available at the dollar store). 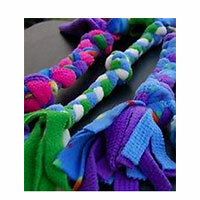 Thread three strips of fabric through the tennis ball and knot each set of “tails” right up next to the tennis ball to prevent it from slipping along your braid. Braid each tail out 6 to 12 inches. Knot the braid to finish it. Squeeze all of the air out of the plastic bottle. Place this inside of an old sock. Add more water and freeze until totally frozen. Remove and let defrost enough so that the ice block or cube can break free of container.